Hak5 isn't your typical tech show. It's hacking in the old-school sense, covering everything from network security, open source and forensics to DIY modding and the homebrew scene. Damn the warranties, it's time to Trust your Technolust. 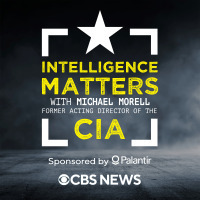 In Intelligence Matters, former acting Director of the CIA Michael Morell, speaks with top leaders of the U.S. intelligence community as they reflect on their life, career and the critical roles they play in shaping national security policies. As a central figure in the most significant U.S. counter-terror efforts of the past two decades and a former CIA intelligence analyst, Morell is uniquely skilled at taking industry leading knowledge to make connections that provide deep insight into complex security events – helping decode intelligence officials’ key priorities and providing perspectives on how to achieve national security objectives. Morell is the author of “The Great War of Our Time” and a vivid account of the Central Intelligence Agency, a life in secrets, and a war in the shadows. Want TED Talks on the go? Every weekday, this feed brings you our latest talks in audio format. Hear thought-provoking ideas on every subject imaginable -- from Artificial Intelligence to Zoology, and everything in between. Every week Leo Laporte talks to the smartest people in the world about the most important topics in technology. Records live every Monday at 2:00pm Eastern / 11:00am Pacific / 18:00 UTC. Facebook Security Checkup Security Checkup will help you: Log out of Facebook from unused browsers and apps. Get login alerts that notify you if someone tries logging into your account from a new computer or phone. Learn how to protect your password. Google Security Checkup Check the security of your Google account. Have I Been Pwned – Email Check Check if you have an account that has been compromised in a data breach. My Permissions Check which applications, services or third parties have connection to your online identities. Online Shopping Security Advice for staying safe online. IT Managers Roundtable on IT Risk Presentation for the Tech Collective IT Managers Roundtable discussion on IT RISK held on 06/24/15. The real and complete story – Does Windows defragment your SSD?